Seeds of Faith Always Enough (Bruxvoort-Colligan) A cool and bluesy song that tells the story. 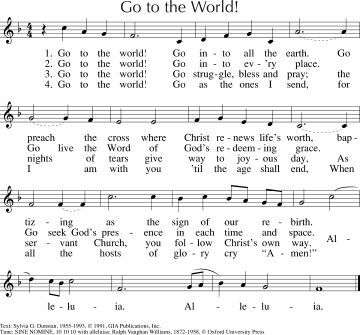 This is not a congregational song, but could be sung by your musicians, or if you are a musical Sunday school teacher, you could use this to tell the story. Lyrics and sound sample. CH763 / MV193 God bless to us our bread (Traditional Argentinian) A lovely simple grace for meals and for communion. More Voices has Spanish and French lyrics as well as English. "God bless to us our bread, and give bread to all those who are hungry, and hunger for justice to those who are fed. God bless to us our bread". This would be very appropriate if you are celebrating communion this week. Good for kids. Short video. 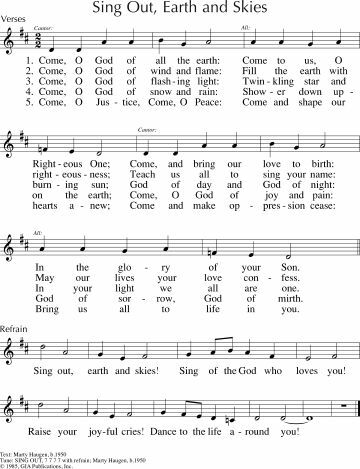 *TiS 702 / NCH768 / SFFS 2014 / GC257 / GC(II)263 / G(3)331 / PfAS146B / Lau539 Alleluia 7 (Taize) A very straightforward Alleluia that builds with energy. PfAS uses this as a refrain to a cantored (or read) version of Psalm 146. God heals. Turns mourning into dancing. Weeping may linger, but joy comes in the morning. Galatians 1:11-24Paul was a persecutor, but then experienced God and was lead to change and proclaim Christ. *TiS 210 / AHB 141 / NCH42 / CH352 / UMH57 / VU326 / LBW42 / ELW295 / A&M742 / HPP74 / GtG610 / PH466 / CP306 / CP(E) 534 / W&R96 / Cha005 / Srce506 / 82Hml-493 / StF364 / MP496 O for a thousand tongues to sing (Wesley) A classic. I particularly love NATIVITY for these words, and it's such a fun tune. Be careful with the words "ye dumb". Voices United has "Hear him you deaf, you voiceless ones, your tongues again employ" which is more respectful. Lyrics and one possible tune. Oldy-but-a-goody. TiS 727 / ATE 208 / CH121 / VU745 / AA70 / PfAS022F In the presence of your people (Chambers) A good Yiddish tune - lots of fun for kids and adults. Good to get fast and dance around on this one. Good for kids! Jesus resuscitates the widow’s son. TiS 737 / Iona (Common Ground, HSNW, T1AU) / A&M516 / SP142 / URW427 / Lau437 Lord Jesus Christ lover of all (Bell) A beautiful and simple chant. Note that some versions (T1AU at least) has a beautiful 4 part harmony arrangement with excellent moving parts in the lower registers. TiS 341 / AHB 257 / NCH222 / CH399 / VU143 / A&M147 / WoV661 / LBW094 / ELW782 / SFFS 2083 / HPP329 / GtG209 / PH076 / CP184 / CP(E) 112 / Srce2-426 / 82Hml-458 / Lau752 / StF277 / MP478 My song is love unknown (Crossman) I really love this old and beautiful song. I prefer it sung to LOVE UNKNOWN. Lyrics. Oldy but a goody It doesn't have to be saved up for Good Friday / Maundy Thursday. Lyrics. TiS 728 Jesucristo reina reina ya! A fun Puerto Rican song. It's particularly fun if someone is brave enough to yell out a "call" at the start of each verse. Good for kids. Do you have some ideas that others may find helpful? Please add a comment below! Hi Natalie, Rev Scott Finlay here from High Street Road UCA in Mt Waverley. Here are two links on YouTube for different renditions of the song "When the poor ones"
They are quite good I think.